Ruby/Sapphire GROWLITHE has a superb sense of smell. Once it smells anything, this POK�MON won�t forget the scent, no matter what. Emerald Its superb sense of smell ensures that this POK�MON won�t forget any scent, no matter what. It uses its sense of smell to detect the emotions of others. Leaf Green It is very protective of its territory. It will bark and bite to repel intruders from its space. Diamond/Pearl A Pok�mon with a loyal nature. It will remain motionless until it is given an order by its Trainer. 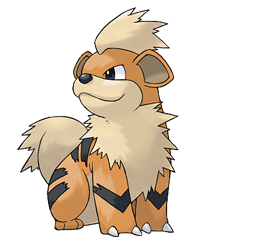 Platinum A Pok�mon with a loyal nature. It will remain motionless until it is given an order by its Trainer. Heart Gold It has a brave and trustworthy nature. It fearlessly stands up to bigger and stronger foes. Soul Silver Extremely loyal, it will fearlessly bark at any opponent to protect its own Trainer from harm. Black A Pok�mon with a loyal nature. It will remain motionless until it is given an order by its Trainer. White A Pok�mon with a loyal nature. It will remain motionless until it is given an order by its Trainer.